The so-called “Cola Wars” have gone global, with battles for soft drink supremacy being waged around the world with flavors you wouldn’t think would be possible. This post looks at Pepsi-Cola, a huge multinational corporation that’s trying harder and harder to catch up to number one, Coca-Cola. How hard are they trying? These bizarre soda flavors and the creative advertising used to sell them give a good indication. 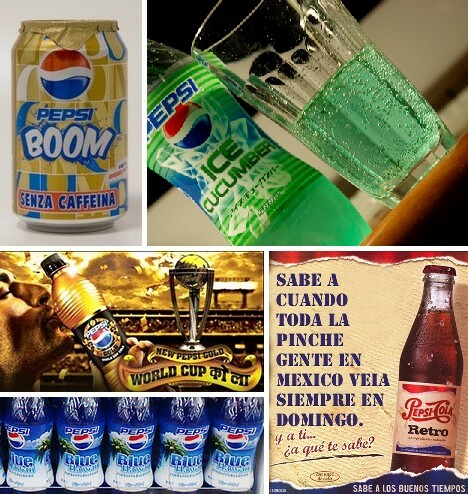 Pepsi Retro was released into the Mexican market with great fanfare in early 2008. The introductory campaign was rife with retro Pepsi imagery, aged parchment paper tinted posters and multimedia presentations involving old-fashioned cars, trucks & airplanes. 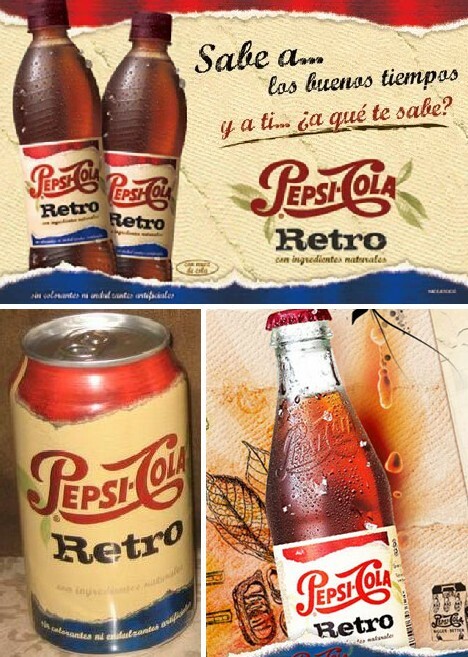 Pepsi Retro was offered in cans, non-returnable glass bottles and two sizes of PET plastic bottles – and ONLY in Mexico. Considering the cult following garnered by Mexican Coca-Cola, one wonders if Pepsi Retro was also surreptitiously imported into the United States. Those who were able to taste-test Pepsi Retro compared it with a similarly formulated product, Pepsi Raw – introduced previously in Great Britain. Both colas were made with cane sugar instead of HFCS corn syrup, used natural kola nut extract for flavoring, had stronger carbonation, appeared to be lighter in color, and tasted “raisin-like”. 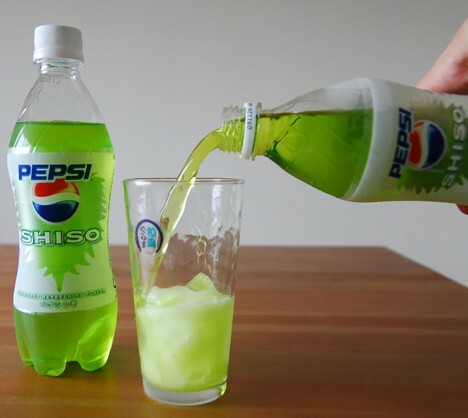 This limited edition pale green tinted, cucumber-flavored Pepsi was sold in Japan in the summer of 2007 though the sheer oddness of the concept garnered it (and Pepsi) much attention in other parts of the world where it was never sold. 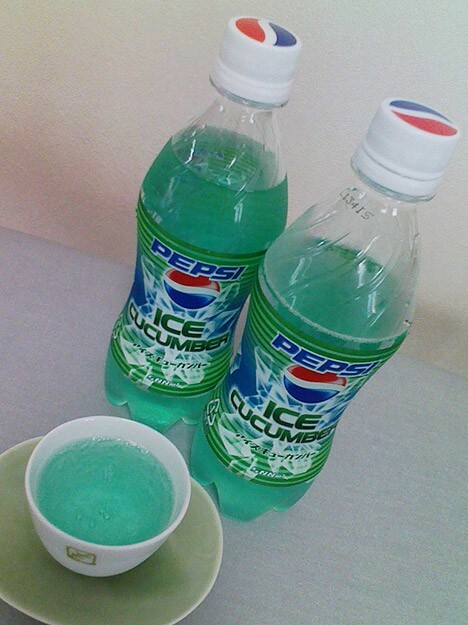 Although new actual cucumbers were harmed, er, used in the making of Pepsi Iced Cucumber, execs at Pepsi Japan considered that omission to be besides the point. “We wanted a flavor that makes people think of keeping cool in the summer heat. 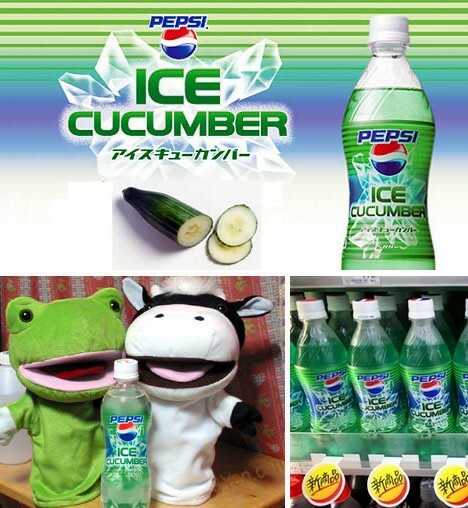 We thought the cucumber was just perfect”, said one Pepsi Japan spokesman. 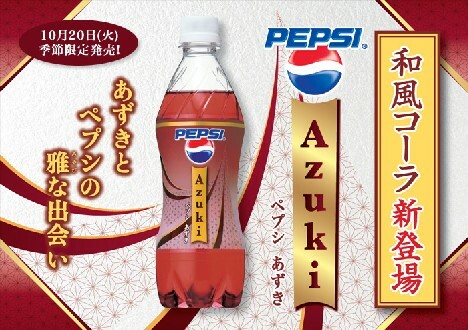 What’s an azuki, and why would anyone want to use it to flavor Pepsi? To answer the first part of the question, azuki is a small maroon bean used to add a sweetish taste to traditional Japanese snacks and desserts. As for the second part… lord only knows! Those who were fortunate (or unfortunate, as the case may be) to try Pepsi Azuki reported that it tasted neither like Pepsi nor azuki… maybe because “azuki” was conspicuously missing from the listed ingredients. And maybe it’s just as well. 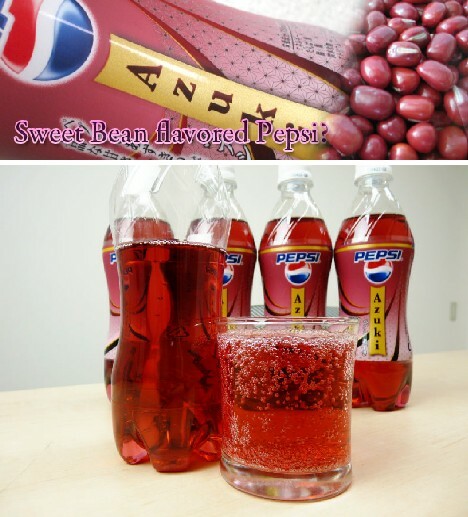 Pepsi Azuki was introduced to the Japanese market in late October of 2009, and as it was always intended to be a limited release, it’s difficult to judge whether it was a success or a failure. 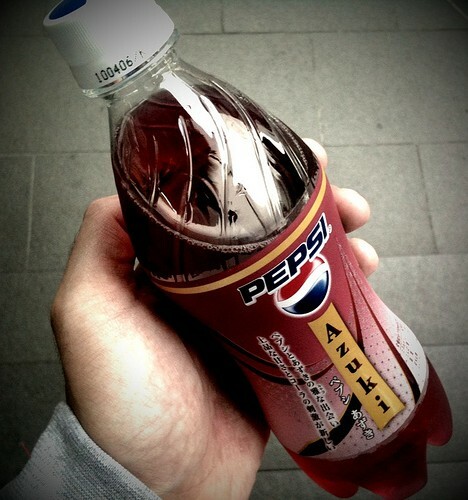 Pepsi Azuki has not been re-released, so perhaps we can assume the latter. 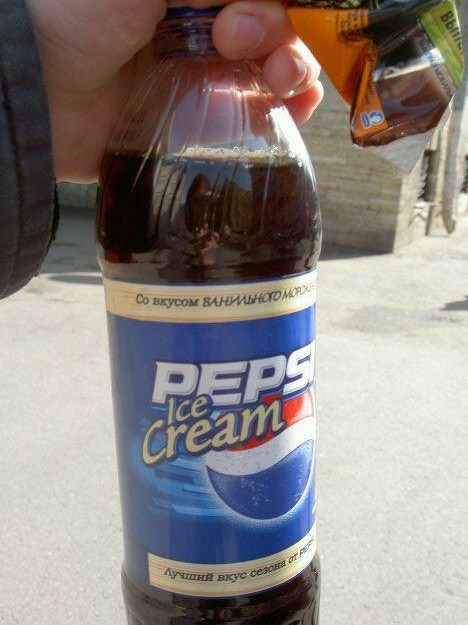 Not much is known about Pepsi Ice Cream, other than it’s sold only in Russia and tastes sort of like cream soda. Pepsi has a long history in Russia, in fact it has the distinction of being the first foreign product officially sanctioned for sale in the Soviet Union. With the fall of communist hegemony in 1991, however, Pepsi became associated with the old regime and the new guy, Coca-Cola, rapidly gained market share. Doh!! 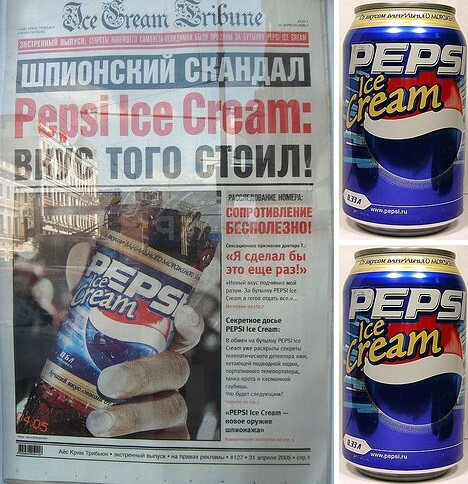 The ad above, photographed on Moscow’s Tverskaya Street, promotes Pepsi Ice Cream with a curious Cold War angle: a secret agent broke down and spilled his secrets in exchange for Pepsi Ice Cream. The spy is quoted as saying “And I’d do it again… the taste was worth it!” Putin and Pepsi – is there anything they can’t do? 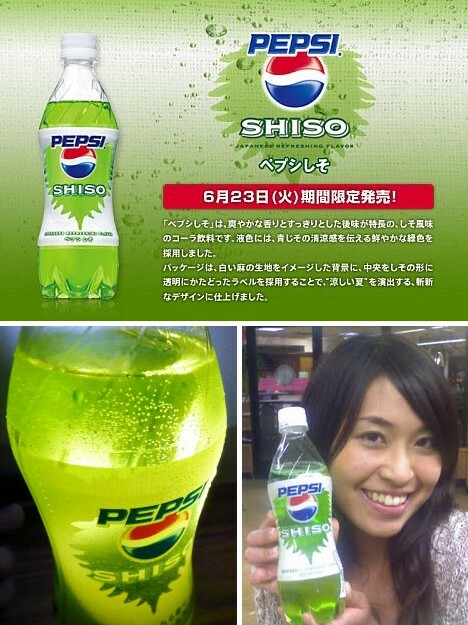 Another wacky entry from Pepsi Japan, Pepsi Shiso displayed an off-putting brilliant green hue reminiscent of toxic nuclear waste as depicted in Teenage Mutant Ninja Turtles cartoons. Flavored with Shiso – an aromatic leaf with a slightly similar smell and taste to basil – the drink was introduced in Japan on a limited time basis during the summer of 2009. 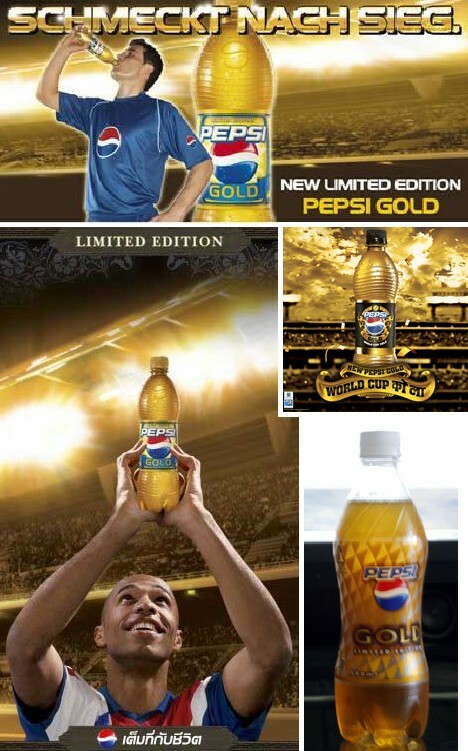 Pepsi Gold was designed to evoke the excitement of soccer’s 2006 FIFA World Cup. 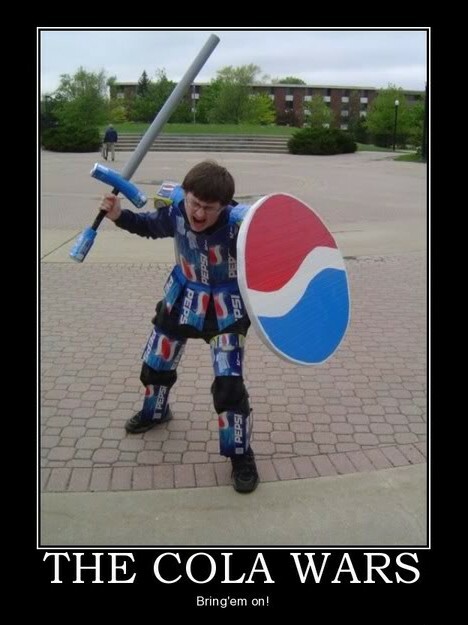 Pepsi then extended the drink’s lifespan long enough to tie in with the ICC Cricket World Cup. 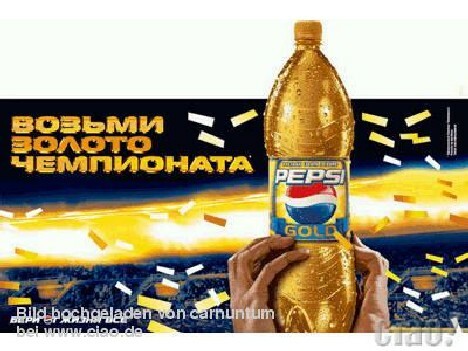 Pepsi Gold was sold in a number of soccer-loving nations such as Germany, Finland, Central Europe, the Middle East and Southeast Asia. 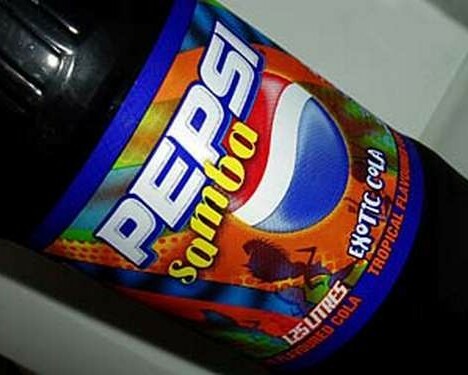 Pepsi Samba was a short-lived and, some say, terrible tasting cola concoction offered for a very limited time in Australia and, for some odd reason, selected stores in Spain. 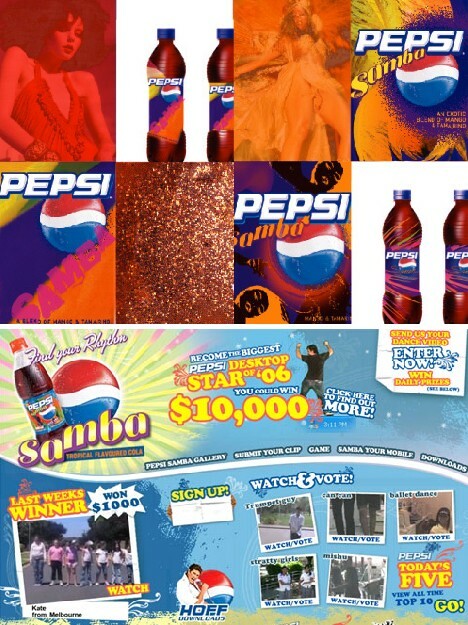 Touted as a “Tropical Flavoured Cola”, Pepsi Samba was flavored with mango and Tamarind, a tropical seed fruit with a sour/sweet flavor popular in the Middle East, Latin America, Asia – pretty much everywhere EXCEPT Australia. Released in the fall of 2005, Pepsi Samba proved to be wildly unpopular and Australian supermarkets quickly began slashing prices to clear out their stock – in some cases as low as 15 cents for a 2-liter bottle! 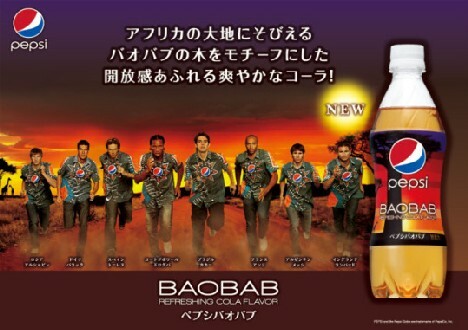 What is it about Japan and bizarre Pepsi flavors? 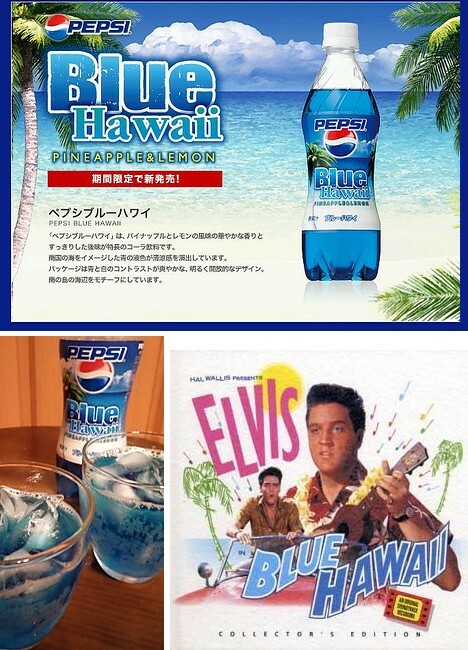 Not to mention colors… which brings us to Pepsi Blue Hawaii, inspired by old Elvis movies and flavored with lemon and pineapple. 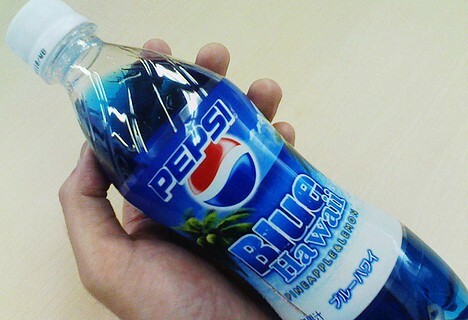 Pepsi hasn’t had a great history with blue drinks – the blandly named “Pepsi Blue” being a prime example – but since Pepsi Blue Hawaii was only intended to be a limited edition I guess the powers that be at Pepsi let this one slip by. 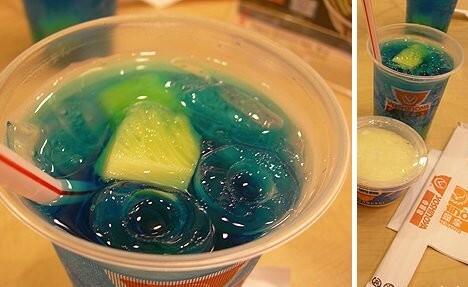 Yoshinoya, a Japanese fast-food chain, featured Pepsi Blue Hawaii as one of three tropical soft drinks available with its Hot & Spicy Sensation meal promotion. They served it in a curious way… with chunks of pineapple. Check please! 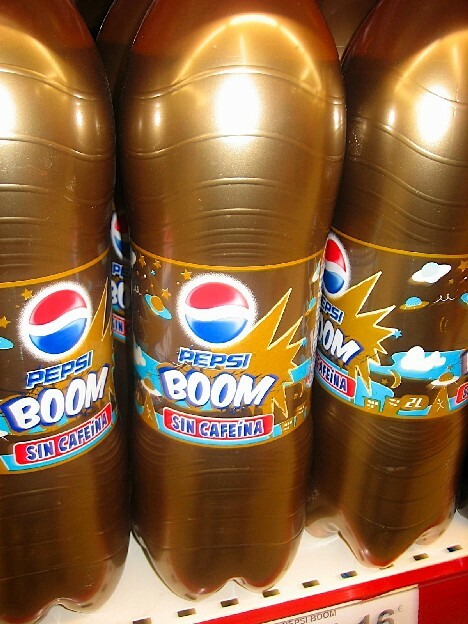 Now here’s a Pepsi flavor you won’t be seeing on airline drinks carts anytime soon: Pepsi Boom. Advertised as being free of caffeine, sugar and artificial sweeteners, one wonders why anyone would want to drink Pepsi Boom when water is free of those same things – and is free, to boot. 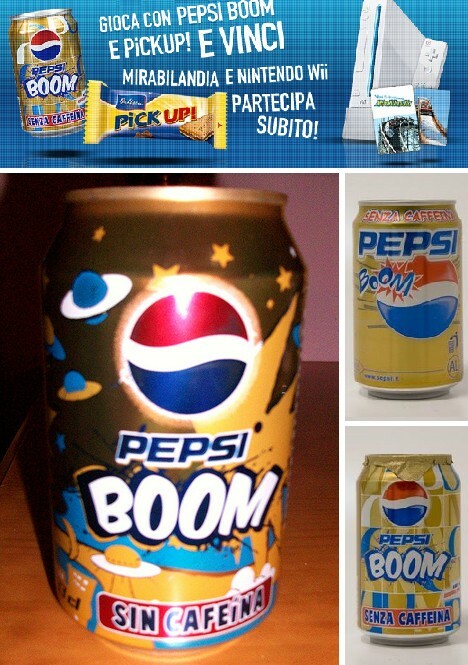 You can find Pepsi Boom for sale in Germany, Italy and Spain… which somehow makes sense. Rumors saying that the fridge in der Fuhrerbunker was stocked with Pepsi Boom are probably not true. The strangest Pepsi flavor is from Japan (no surprise) and it’s also one of the newest; maybe THE newest, as it’s due to be released later this month. So forget Mangosteen, Acai, Pomegranate and Goji berries, Baobab is the new trendy flavor we’ll be seeing WAY too much of over the next while. Baobab, also known as the Bottle Tree, is a weird, wide tree native to southern Africa and Australia. Its fruit, called Monkey Bread, is said to have a flavor reminiscent of wine gums – not a bad basis for a soda. Baobab fruit is said to be higher in vitamin C than oranges and offers more calcium than a comparable quantity of cow’s milk. Very nice, very healthy. 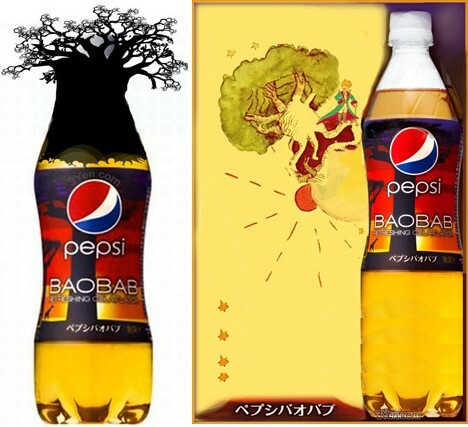 Will Pepsi Baobab contain any actual Baobab extract? If history is any guide, very unlikely. If colas actually went to war, then these bizarro flavors are surely its wonder weapons. Don’t think that the art of odd flavors is solely practiced by Pepsi, either – future posts will look at what diabolical formulas The Other Guys are whipping up in an effort to slay the competition and satisfy our taste buds.